This document is a technical summary of the Federal Highway Administration report, Surrogate Safety Assessment Model and Validation: Final Report, FHWA-HRT-09-029. The Federal Highway Administration (FHWA) organized 26 States to participate in the FHWA Low-Cost Safety Improvements Pooled Fund Study as part of its strategic highway safety plan support effort. The purpose of the pooled fund study is to estimate the safety effectiveness for several of the unproven, low-cost safety strategies identified in the National Cooperative Highway Research Program (NCHRP) 500 Series reports. One of the strategies chosen to be evaluated for this study was advance street name signs at signalized intersections. This strategy is intended to reduce the frequency of older driver crashes and crashes related to way-finding (i.e., rear-end and sideswipe crashes) at signalized intersections. Advance street name signs have the potential to reduce way-finding crashes because they provide drivers with additional time to make necessary lane changes and route selection decisions. The safety effectiveness of this strategy has not been thoroughly documented; this study is an attempt to provide a crash-based evaluation through scientifically rigorous procedures. The high percentage of intersection crashes is not surprising because intersections present more points of conflict than nonintersection locations. In urban environments, intersections are often closely spaced, and driver workload may increase due to increased visual clutter. This issue presents a safety concern, especially for older drivers who may require more advance notice of upcoming cross streets to make way-finding decisions. To improve safety for drivers at approaching intersections, the use of advance street name signs has been recommended, as discussed in the NCHRP Report 500 Series Volume 9: "A Guide for Reducing Collisions Involving Older Drivers. "(2) The Manual on Uniform Traffic Control Devices (MUTCD) provides guidelines for installation or upgrade of guide signs, including advance street name signs. (3) Figure 1 shows an example of an advance name street sign from MUTCD. Figure 1. Photo. Advance street name guide signs from MUTCD. While the literature supports the use of advance signs, particularly for increased way-finding, there have been no rigorous evaluations of the safety effectiveness of this strategy. An investigation is needed to thoroughly evaluate the effectiveness of advance street name signs in reducing crash frequency and severity for signalized intersections, particularly for older drivers. The safety effectiveness of advance street name signs is explored empirically in this study to provide better support to the States when selecting safety improvements at signalized intersections. Figure 2 is a photograph of an advance street name sign in its natural environment. Figure 2. Photo. Example of an advance street name sign. Data were collected from several States that have installed advance street name signs at signalized intersections. Study locations were selected from Arizona, Massachusetts, and Wisconsin based on the availability of installation data, including the location and installation date. Geometric, traffic, and crash data were obtained for a total before period sample of 993 site-years (587 from Arizona, 130 from Massachusetts, and 276 from Wisconsin) and 829 site-years in the after period (395 from Arizona, 158 from Massachusetts, and 276 from Wisconsin). Site-years are the number of intersections where the strategy was applied multiplied by the number of years the strategy was in place at each intersection. For example, if a strategy is applied at nine intersections and is in place for 3 years at all nine intersections, there are a total of 27 site-years available for the study. Geometric, traffic, and crash data were also obtained for reference intersections with characteristics similar to the strategy sites in all three States but without advance street name signs. Empirical Bayes (EB) methods were incorporated in a before-after analysis to determine the safety effectiveness of advance street name signs at signalized intersections. The EB methodology for observational before-after studies was used for the evaluation and is more thoroughly described in the full report. (4) Figure 3 depicts an example of an advance street name sign in Arizona with standard dimensions in inches. Figure 3. Chart. Example of an advance street name sign in Arizona. Safety performance functions (SPFs) were calibrated separately for each State for use in the EB methodology. Generalized linear modeling (GLM) was used to estimate the model coefficients using the software package STATA®. (5) A negative binomial error distribution was assumed for the GLM, which was consistent with the state of research in developing these models. Total intersection-related crashes (within 228.75 m (750 ft) of the target intersection). Crashes involving older drivers (65 years old and older). The full report includes a detailed explanation of the methodology, including a description of how the estimate of percent reduction is calculated. Figure 4 shows an actual advance street name sign on a roadside in Wisconsin. Figure 4. Photo. 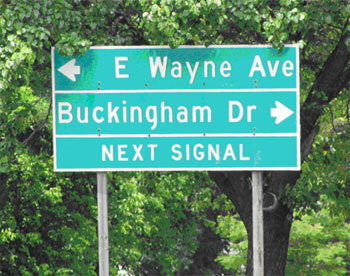 Example of an advance sign in Wisconsin. Two sets of results were calculated and are presented in the following sections. One set contains aggregate results for the three States combined. The other set is based on a disaggregate analysis that attempted to discern factors that may impact the safety effectiveness of this treatment. The aggregate results are shown in table 1 for all three States combined. A 10-percent reduction is shown for sideswipe crashes, which is significant at the 90-percent confidence level. There was a slight decrease in total and injury-related crashes, but the change was insignificant at the 90-percent confidence level. Similarly, there was a slight increase for older driver and rear-end crashes, but the change was highly insignificant. The results generally indicate an insignificant effect on safety except for sideswipe crashes (10.3-percent reduction). The simulation-based intersection conflicts data provided by SSAM were significantly correlated with the crash data collected in the field, with the exception of conflicts during path-crossing maneuvers (e.g., left turns colliding with opposing through-traffic), which were under-represented in the simulation. Intersection rankings based on total conflict frequency correlated with intersection rankings based on total crash frequency with a Spearman rank coefficient of 0.463 (and similarly for rear-end and lane-change incidents). The relationship between total conflicts and total crashes in this study (shown in figure 3) exhibits a correlation (R-squared) value of 0.41. Table 1. Combined results for advance street name signs in all three States. Note: A negative sign (-) indicates an increase in crashes. Bold denotes those safety effects that are significant at the 90-percent confidence level. Combined results for older drivers include data from Arizona and Wisconsin only. Separate results for each State were also calculated and are presented in the full report. Results from the individual State analyses were generally consistent. The change in total, injury, older driver, and rear-end crashes were minimal and statistically insignificant. For sideswipe crashes, there was a significant reduction in Massachusetts (27.2 percent) at the 95-percent confidence level, but the change was minimal and statistically insignificant in the other two States. Due to the fact that these signs were installed as a way-finding improvement and not a safety improvement, it is not surprising that there is a minimal effect on total crashes. The disaggregate analysis is presented in the following section, indicating specific situations where the strategy may be more effective. Three-legged intersections (signs on the major road) when compared to four-legged intersections. Intersections with relatively large AADTs. The threshold is 10,000 vehicles per day, 20,000 vehicles per day, and 30,000 vehicles per day for Massachusetts, Arizona, and Wisconsin, respectively. Intersections with two or more signs per approach compared to one sign per approach. Intersections with relatively larger numbers of expected crashes prior to the strategy. The disaggregate analysis also attempted to discern the effects by area type and median type, but results did not indicate a consistent pattern. For Arizona and Massachusetts, advance street name signs appeared to be more effective in urban areas; however, advance street name signs appeared to be more effective in rural areas in Wisconsin. Arizona was the only State included in this study with both divided and undivided treatment sites. Based on the disaggregate results from one State, it appears that advance street name signs are more effective on undivided roadways. There are advantages and disadvantages to applying the results from the disaggregate analysis. The disaggregate analysis can shed light on specific conditions where strategies may be most effective; however, disaggregate analyses are, by nature, based on smaller sample sizes than aggregate analyses. Smaller samples lead to larger confidence intervals and less precise results. A general rule cannot be applied when using either the aggregate or disaggregate analysis; rather, the choice on which analysis to use should be made on a case-by-case basis. In the case of the advance street name sign analysis, the aggregate analysis generally indicates that the use of this strategy does not significantly affect total crashes. If advance street name signs are implemented, the disaggregate analysis indicates that specific conditions should be given priority due to the relative effectiveness of this strategy (along the major road at three-legged intersections and locations with relatively large AADTs). The purpose of the economic analysis was to evaluate the feasibility of advance street name signs. The economic analysis was accomplished by estimating the life cycle cost of the strategy and the discounted annual cost of the strategy. Crash cost savings were estimated from the most recent FHWA unit crash cost data. (6) The annual crash reductions necessary to offset the cost were estimated by comparing the cost of the strategy to the crash costs. Arizona and Massachusetts provided installation and maintenance costs for advance street name signs, as well as the expected service life. A conservative estimate for the cost of an advance street name sign was assumed to be $1,215 per sign in Arizona and $750 per sign in Massachusetts. The expected service life for advance street name signs was assumed to be 10 years based on information provided by the Arizona Department of Transportation and the Massachusetts Highway Department. Based on information from the Office of Management and Budget, a discount rate of 2.6 percent was used to determine the annual cost of the strategy. (7) This resulted in an annualized cost of $140 per sign for Arizona and $86 per sign for Massachusetts. Assuming two signs per intersection (one for each major road approach), the annual cost per intersection was $280 for Arizona and $172 for Massachusetts. A reduction of 0.010 crashes per intersection-year would achieve a 2:1 benefit-cost ratio in Arizona, assuming two signs per intersection. For Massachusetts, a reduction of 0.006 crashes per intersection-year would achieve a 2:1 benefit-cost ratio. If more than two signs are used per site, a greater reduction in crashes would be needed to achieve a 2:1 benefit-cost ratio because the additional signs would increase costs. Even with the conservative assumptions made, a very modest reduction in crashes is required to justify this strategy economically. Based on the results of this study, it appears that advance street name signs do not have a significant effect on total crashes at signalized intersections and would not be justified based solely on expected reduction in total crashes. The analyses of target crashes did, however, indicate a significant reduction in sideswipe crashes (10 percent) for the three States combined. Advance street name signs may be justified as a safety treatment based on the number of sideswipe crashes at a given location. The objective of this study was to evaluate the safety effectiveness of advance street name signs at signalized intersections, as measured by crash frequency, within 228.75 m (750 ft) of the intersection. The study also examined the effects of this strategy on specific crash types. Total, injury, older driver, rear-end, and sideswipe crashes were examined in a rigorous crash-based analysis. The results of the aggregate analysis indicated a small, statistically insignificant change in total crashes for Arizona, Massachusetts, Wisconsin, and overall for the three States combined. For target crash types (i.e., older driver, rear-end, and sideswipe), the aggregate analysis generally indicated no significant change in crashes. The only significant change was for sideswipe crashes, which included a 27-percent reduction in Massachusetts and a 10-percent reduction for all three States combined. From a practical standpoint, results presented in table 2 support the conclusion that advance street name signs have a minimal effect on total and target crashes. This conclusion is based on the fact that none of the estimates from the combined three-State analysis were statistically significant at the 95-percent confidence level. Only the reduction in sideswipe crashes was significant at the 90-percent confidence level. The conservative estimates reflected the lower 90-percent confidence limits. Where the 90-percent confidence interval included 0, the conservative estimate was reported as 0. It may, however, be necessary to use the point estimates from column 2 when comparing multiple potential countermeasures, particularly when confidence limits are not available for all potential strategies. This way, all countermeasures are treated equally when making a cost-benefit comparison. The disaggregate analysis provided further insight into the circumstances where advance street name signs may be more effective. Installations along the major road at three-legged intersections were found to be more effective than at four-legged intersections, and two or more signs per approach were shown to be more effective than a single sign per approach. The analysis also indicated a greater reduction in total crashes for intersections with relatively large AADTs and five or more expected crashes in the before period (i.e., those intersections with the most crashes were likely to experience greater reductions in crashes). Table 2. Expected crash reductions for installations of advance street name signs. Note: A negative sign (-) indicates an increase in crashes. The conservative estimates reflect the lower 90-percent confidence limits. Where the 90-percent confidence interval includes 0, the conservative estimate is reported as 0. The general conclusion from this research is that advance street name signs have a minimal effect on the total number of crashes at signalized intersections. Similarly, there were no significant changes in rear-end, older driver, or injury-related crashes. However, at specific locations (i.e., along the major road at three-legged intersections and locations with a relatively large AADT or number of expected crashes), this strategy has a greater potential to reduce crashes. Based on the results from Massachusetts and the three States combined, this strategy also appears to be effective for reducing sideswipe crashes within 228.75 m (750 ft) of signalized intersections. It was expected that advance street name signs would be more effective for reducing way-finding crashes, particularly sideswipe crashes, because they provide drivers with additional time to make necessary lane changes and route selection decisions. Given the very low cost of this strategy and the potential to enhance way-finding, the use of advance street name signs is justified as a way-finding improvement, particularly on the major road at three-legged intersections as well as locations with a relatively large AADT or large expected number of crashes. From a safety standpoint, this strategy may be justified as an effective measure to reduce sideswipe crashes at or near signalized intersections, but it may not be justified as an effective measure to reduce total crashes. Potts, I., Stutts, J., Pfefer, R., Neuman, T.R., Slack, K.L., and Hardy, K.K. (2004). “Guidance for Implementation of the AASHTO Strategic Highway Safety Plan: A Guide for Reducing Collisions Involving Older Drivers.” NCHRP Report 500 Series, Vol. 9. Transportation Research Board. Washington, DC. Federal Highway Administration. (2003). The Manual on Uniform Traffic Control Devices (MUTCD). Washington, DC. Obtained from: http://mutcd.fhwa.dot.gov/pdfs/2003r1r2/mutcd2003r1r2complet.pdf. Site last accessed June 24, 2008. STATA® Release 9. (2005). StataCorp LP. College Station, TX. Council, F., Zaloshnja, E., Miller, T., and Persaud, B. (2005). Crash Cost Estimates by Maximum Police-Reported Injury Severity within Selected Crash Geometries. Federal Highway Administration. McLean, VA.
Federal Register. (2008). Notice of Public Hearing, Federal Register, Vol. 73, No. 20. (January 30, 2008). Obtained from: https://www.whitehouse.gov/omb/fedreg/2008/013008_discountrate.pdf. Site last accessed June 25, 2008. Researchers—Kimberly Eccles and Frank Gross of Vanasse Hangen Brustlin, Inc., were the primary investigators. Bhagwant Persaud, James Jenness, and Andrea Piesse provided research support for this study. For more information, contact Roya Amjadi, FHWA Project Manager, HRDS-06, at (202) 493-3383, roya.amjadi@dot.gov. they are considered essential to the objective of the document.